On my last day stay in Hong Kong, right after my breakfast in Yun Kee wanton cafe, I told myself that I must not miss grabbing a shot of the typical street view in Hong Kong. At that moment, it was a fairly good day with proper sunlight as my main source. 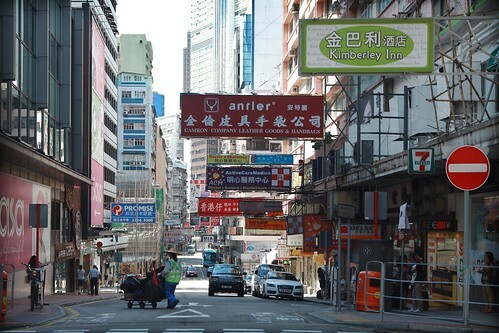 From just outside the cafe, I took a shot of this T-junction road with all the typical signboards hanging on either side of the buildings. I have added contrast and vignetting on this shot with cropping to make the composition better. I missed the food there where I had my very nice macaroni, scrambled egg, toasted butter bread, wanton noodles, roasted goose, gui ling gao which is the black jelly and of course the seafood there. I don’t mind going back there again. Hee! 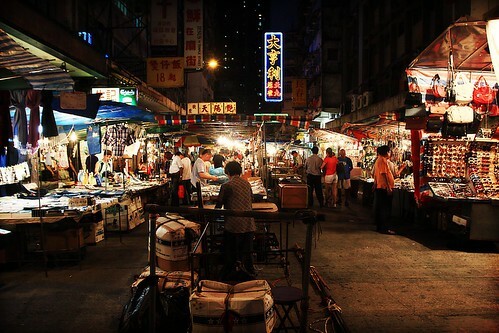 When I saw this night market during my stay in Hong Kong, I could not resist taking a photo. As it is not so crowded at that time, I could take my time composing the shot before I took it with high ISO on ultra wide angle. I pushed up my contrast to give it the ‘feel’ of old hongkie style. Well, you could have mistaken this shot for a photo taken in any part of China but I would want to remember my trip here with the post. With this shot done with 16-35mm L on my 5D II, I processed it under photoshop with cropping, punching up contrast and curves. Walking along the streets in Hong Kong at night could be very fun. It seems like the life there goes on till very late after mid night. The traffic seems never ending with its constant flow of various mode of transport with commuters. Even though it is a weekday, you will still get crowds along the streets at night after office hours. The traffic in Hong Kong is quite similar to Singapore’s with its horns and jams along the road. But the traffic jams are still manageable, at least the traffic do not get stuck for hours. Well, I can say that the traffic is actually slow moving. I knew that after the sky gets dark, I have to give my 50L a try. And there goes the sharpness, I just love it! To me, it is almost a great walk about lens because I still prefer wide angle now for landscapes. But I have not try my 50mm L lens on street photography yet. Perhaps, it will make a very good portrait lens to capture different expressions. For now, I feel that I should try to get very comfortable with the focal length of 50L as I never have 50L on full frame before and not very sure on many different compositions that I should get. Nevertheless, I wish to share this shot of mine which I also did some post processing under photoshop for vignetting and exposure blending. I did not do any sharpening as I deem that it is really that good enough from a prime lens. Lei Yue Mun, which is pronounced as Lay-e Yu Moon. 鯉魚門 is the chinese character for it. 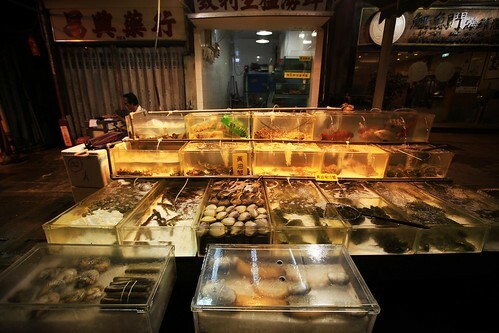 It is a fish market where you can really have a very sumptuous seafood meal! I had mine there! I’m not sure if I’m hungry or the food is really tasty but I liked the food a lot! Cholesterol should not be mentioned when you are there. Haa! Anyway, after having my taste buds satisfying meal. We took a short walk along the street and the displays of the seafood for sale there are just so classic! I took a shot and would very much want to share it here. I did not find out whether they have exotic seafood for sale! This shot was done with high ISO with ultra wide angle lens on 5D II. I did my composition quickly and got it the second try as my horizon was not good. Too full and lazy to concentrate I guess. 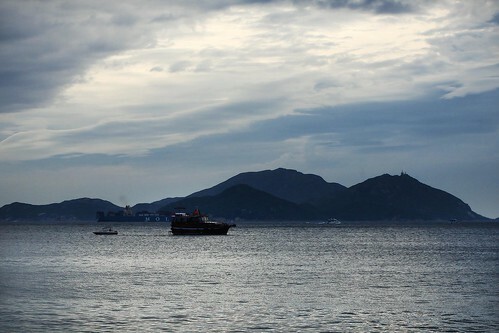 Being at the Southern part of Hong Kong, Repulse Bay is one of the most expensive housing areas in Hong Kong. As believed in Chinese Feng Shui that whichever house that is located with mountain at the back and water from ahead is a house that could bring fortune. These houses can be found around Repulse Bay. 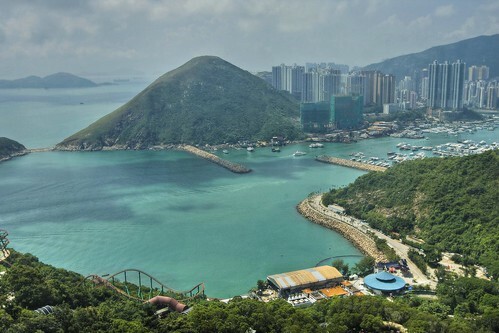 There are many tall blocks of houses around the Repulse Bay that has very gorgeous view over the southern China sea. 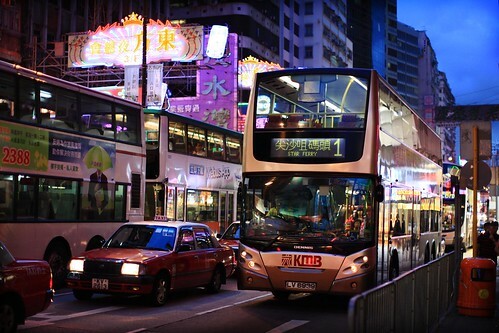 To attract swimmers, bus route made it easy for them to commute between the beach and Central in Hong Kong. I did not get to swim there but I was rather interested to grab some shots from the sea out front. It is a nice place but nothing to shout about as there are not many gorgeous sights to be indulged in. With my wide angle lens, I got this shot and cropped it to make the boat into the main subject with more focus on it. Before leaving for Hong Kong, we decided not to visit the Disneyland there but only Ocean Park as words by mouths gave us the information of lack of hygiene and cleanliness in Disneyland and being nothing much to be seen. So we went ahead with visiting Ocean Park only. We did not regret our choice as the Ocean Park offers much more fun and enjoyment than we expected. It was really warm considering the month we were there was September. There are many rides that you can have your share of adrenaline rush. It was fairly crowded and we were able to take our rides within 20 minutes of queuing, that was not so bad after all. You can also enjoy scenery there besides having fun there. There is a train that can take you up to the top part of park. The park was divided into two parts. One part is at the foot of the mountain which is the waterfront and one is at the summit. Allow me to share one of the shots that I took when I was at the summit taking in the landscape of the area at the waterfront. It is definitely a must to go to the peak when you are in Hong Kong for the first time. Well, at least for once. 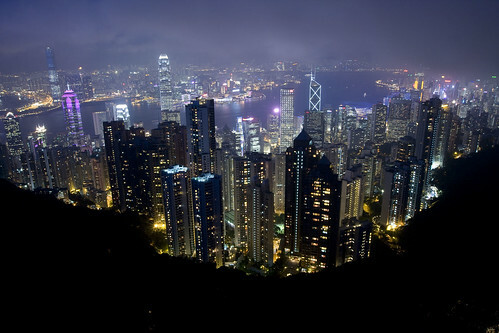 The peak does not only offer great views in the day but also in the night! I believe the shot that I’m going to share has been taken the same way as many others did. But nevertheless, I will also post it here, this post would serve as a good memory spent in Hong Kong. We took a peak tram which was pulled up by cables on a steep railway. It was a very good experience as you are literally lying on the back of your bench chair. Yes! It is that steep! When we arrived at the peak, we walked ourselves around while waiting for the sun to set as I would love to take night shot of Hong Kong city. I brought my tripod up as well. I’m not the only one who brought my tripod up to the peak. Haa! So I’m not the odd one there. Once the sky started to get dark, I mounted my tripod with two legs resting on the railing so that my tripod head would reach further out to get the landscape in.